Hans Broekhuis researches at the Meertens Institute in Amsterdam. He is author of Derivations and Evaluations: Object Shift in the Germanic Languages (Mouton de Gruyter, 2008) and editor/author of the seven-volume Syntax of Dutch (Amsterdam University Press, 2012-6). Ralf Vogel is professor of German linguistics at the University of Bielefeld. He is co-editor, with Artur Stepanov and Gisbert Fanselow, of Minimality Effects in Syntax (Mouton de Gruyter, 2004) and co-author, with Gisbert Fanselow, Caroline Fery and Matthias Schlesewsky, of Gradience in Grammar: Generative Perspectives (Oxford University Press, 2006). This chapter will motivate why it is useful to consider the topic of derivations and filtering in detail. It argues that minimalist and optimality theoretical approaches normally adopt more or less the same global architecture of grammar. It concludes with a brief review of the studies collected in this book. This chapter introduces the so-called derivation-and-evaluation framework and illustrates it by means of a topic that was also discussed in the introduction — Object Shift. It shows that Chomsky’s proposal can be readily rephrased in optimality-theoretic terms and that this has a wide range of empirical consequences. This chapter discusses a number of restrictions on the licensing of parasitic gaps that are problematic in a purely derivational framework like MP but which fall out quite naturally under the hybrid approach by adding a single constraint to the inventory proposed by Broekhuis. 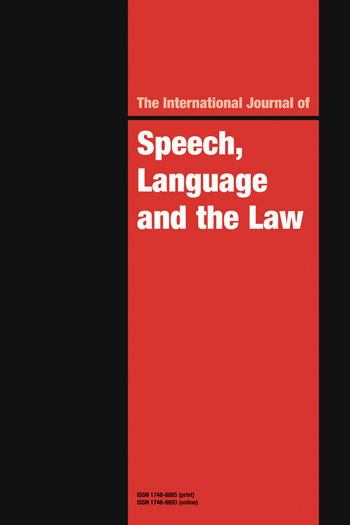 This chapter examines the dialectal and intra-speaker variation that can be found with dative resumption in relative clauses. It argues that the range of variation shows that locality is an inviolable condition on movement, but that the standard version of MP is nevertheless ill-equipped to handle the attested variation. John J. McCarthy is Senior Vice Provost for Academic Affairs, Dean of the Graduate School, and Distinguished University Professor at the University of Massachusetts Amherst. He is the author of Hidden Generalizations: Phonological Opacity in Optimality Theory (Equinox 2007). Kathryn Pruitt is an Assistant Professor at Arizona State University. She received her PhD from UMass Amherst in 2012. She specializes in phonological theory with emphasis on metrical structure and stress typology. 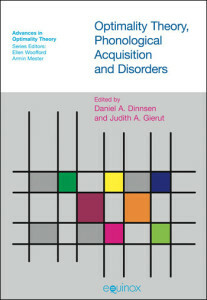 This chapter distinguishes structure-building features, which trigger Merge, and probe features, which trigger Agree. Empirical evidence in favor of local optimization is provided by cross-linguistic differences in case assignment to internal and external arguments, suggesting that many analyses that involve larger domains can be rephrased in terms of local optimalzation while acknowledging that there may be certain analyses that require larger optimization domains. Whereas Heck and Muller (this volume) predict a dichotomy between nominative-accusative and ergative-absolutive languages, Ellen Woolford shows that the distinction is not always clear-cut in that in some languages, the expression of ergative case depends on certain contextual properties of the construction as a whole. The authors show that the optimizaton domain must be at least as large as CP and include a discussion of the cyclic linearization approach favored by Fox and Pesetsky (2005), showing that this approach is less well-equipped to account for the set of data that is addressed in this chapter. The author argues that when it comes to cross-linguistic variation, Optimality Theory meets the requirement of optimal design better than traditional versions of MP developed in the 1990s and that language variation is a predictable outcome of OT. The author of this chapter concludes that only very few of the specifically minimalist properties of the syntactic generator are necessary for OT’s syntax generator, when one exploits OT as interface theory as much as possible. The conception of OT grammar argued for organizes the mapping between semantic, syntactic and phonological/phonetic representations using violable and conflicting mapping constraints. 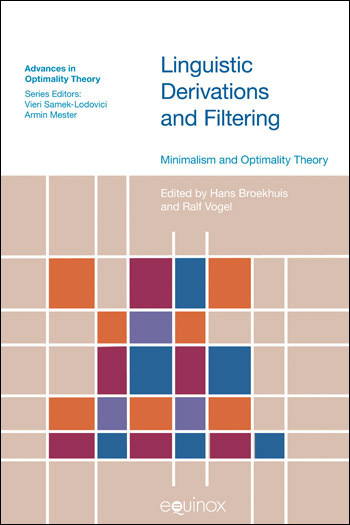 This chapter criticizes the use of the notion of ‘last resort’ and argues that this notion can only receive a coherent interpretation in theories of optimization with constraint interaction. The discussion shows that contrary to popular belief, do -support is not language-specific but arises in different circumstances in different languages. The author argues that the conditions imposed by the sensory-motor and the conceptual-intentional system on the output representations of the generator are necessarily in conflict and therefore (at least partly) violable. This chapter argues that the PF-component determines how the copies of movement are spelled out. The basic hypothesis is that is is done by means of inviolable, universal conditions on the output representations.